Whether a welcome gift from nature or a surprise, there are few greater sources of anxiety in a woman’s life than uncertainty over whether or not she is pregnant. Although there are many telltale signs of pregnancy, such as a late menstrual period or morning sickness, many signs don’t manifest themselves until later in the first trimester. Getting definitive answers on whether you are or are not pregnant is vital in ensuring you get the medical information you need, as well as ensuring that you aren’t engaging in activities that could potentially harm your fetus, such as consuming large amounts of alcohol or smoking. That’s why an accurate home pregnancy tests are vital. Though it may be a sensitive test, it could bring a negative result and put your mind at ease. If you have been trying to get pregnant for a while, you may want to try a homemade pregnancy test, though it is much safer and more accurate to buy a kit. A home pregnancy kit can show a positive result and bring you the joyful news sooner or to not have your hopes kept up in vain. Home pregnancy tests work by detecting human chorionic gonadotropin HCG, also known as the “pregnancy hormone” levels in urine. The lower the level a test can detect, the earlier you can get results. Below, we will profile the best early pregnancy tests to detect your pregnancy with a positive pregnancy test as soon as possible, most of which come complete with a step-by-step guide. There is a reason First Response is the brand you think of when referring to pregnancy. First Response tests are incredibly accurate and give you quick results. The First Response Early Result test can detect pregnancy up to six days before your missed period. First response guarantees results that are 99% accurate from the day of your expected period. The Early Result Kit features a long, mess-free handle and a sizable, easy-to-understand result window. Two lines mean pregnant and one line means not pregnant. The kit is also easy to use, the absorbent tip of the test needs to be submerged in urine for only five seconds and the test takes three short minutes to complete. The First Response Early Result Pregnancy Test is from a line of a trusted brand and is easy to find at any pharmacy. It can also be found on Amazon here. Like the First Response Kit, the Clearblue Early Detection Pregnancy Test can reveal a pregnancy up to six days before a missed period (five days before the expected period). The pregnancy test is 99% accurate from the day of your expected period. The test is foolproof. The wide tip changes colors when it has absorbed enough urine to test. It only needs to be soaked for five seconds. This test also features unique Flood guard technology. This technology has been shown to drastically reduce usage errors. The results will be ready to read in only three short minutes. For detection before a missed period, users are instructed to use their first urine of the day and not to consume too much water, so that the urine is more concentrated. This brand is widely available at pharmacies all over North America, or if you prefer, a little more discretion is available here on Amazon. This early detection kit comes with 25 pregnancy test strips. It is also extremely inexpensive, especially considering how many tests are included in the package. This pregnancy test guarantees that it can detect a pregnancy up to four days before an expected period. This test is clinically proven to provide 99.9% accurate results and detect extremely low HCG level in urine. This test is also foolproof; simply soak the strip in urine for ten seconds and let sit for five minutes. A double line indicates a pregnancy while a single line signifies that you have not conceived. This pregnancy test is ideal for someone who is actively trying to conceive. For the simple fact that there are 25 tests included. This test is available on Amazon here, to guarantee privacy and increase discretion. This inexpensive pregnancy test is available at Walmart and pharmacies nationwide. 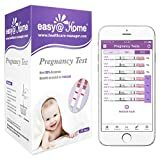 The Equate Early Result Pregnancy Test allows you to test for pregnancy at home five days before your missed period or four days before your expected period. This test is 99% accurate and features an easy to interpret window. A line in each box means that you are pregnant and a line in a single box means you tested negative. This product is inexpensive and easy to find. This at-home early pregnancy detection kit comes with 25 individually sealed strips. These strips can detect a pregnancy at 99.8% accurately a day before you are expecting your period. These strips are appropriate for users actively attempting to become pregnant and eager to see their results. This brand is devoted to great customer service and offers refunds or returns for clients unsatisfied with the product as well as expert customer service staff to answer questions. Available on Amazon here, these strips eliminate any awkwardness you may feel purchasing a pregnancy test and keeps your news private until you feel you want to share it. Which test is right for you is dependent on your personal needs. If you are actively trying to get pregnant and want the freedom to test every few days, then the TrueStick or [email protected] tests both offer 25 strips at an extremely reasonable price. If you’re keen to know, but on a budget, the equate test may be right for you. There is only one test but it is quite inexpensive. 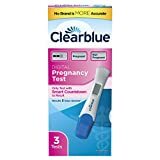 Finally, if you want to be sure and want to test earliest of all, the heavy hitters in the pregnancy test sphere are First Response and Clearblue. Both offer pregnancy detection six days before a missed period and on the day of your expected period, the results are over 99% accurate. With any positive results, we recommend a visit to see you doctor in order to take a blood test. The early weeks of a pregnancy are crucial to a fetus’ health. In order to best protect yourself and your fetus, it is important to identify and address a pregnancy by finding out your HCG levels as soon as possible with a reliable pregnancy test kit—whether you get a negative result or a positive result it is always better to know. The tests described in this article will all offer clear, quick and accurate results. So that instead of feeling anxiety, you can celebrate the existence of your new arrival.